This weeks Bloggers Challenge is Water Coloring. There are many different techniques using water Coloring - for my card I choose to use one of my favorites - Marker Water Coloring from a past issue of the TNJL. 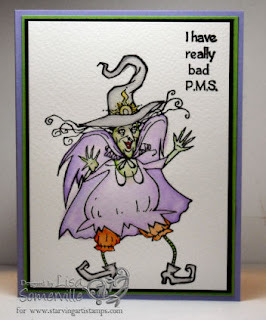 The images on my card come from the Witch Trio at Starving Artistamps - aren't they fun! If you'd like to play along with this weeks challenge, simply leave a link to your creation on this post, or if uploading to SCS use keyword BC65. Have a great weekend! Don't forget if you're going to the Rubber Stamp Expo in St. Charles - stop by and see me - I'll be at the Artistic Oupost Booth! Nicely done Lisa, that image is a sweetie. Boy do I ever know how she is feeling! I wonder if I look like that at those times, lol! Great card Lisa. OMG!!! Tooooooooooooo funny!! I actually did LOL when I saw this! Oh my goodness...What a funny card (that sentiment cracks me up!) Great job with the watercoloring and those witches are just so fun. Wonderful coloring Lisa! Funny sentiment! These witches are so dang adorable! Love the colors you chose for the watercoloring...FAB job!!! Fun image and beautifully colored, too! Oh my gosh! It's me!!! That's how i felt ALL Weekend! Great job with the technique. This card Rocks!